Grass is a plant that is so much a part of our lives, yet our knowledge of this plant is very scanty. Look around your home and you will see the close relationship with grasses. The broom, the food (rice/wheat/corn), sugar (sugarcane), lawns, paper, drink (beer, whisky), in religious rituals, construction and in several others there is always a grass in use. How many grasses do we know by name that we see almost every day but ignore or generally dismiss as weeds? With monsoon still around there would be more species of grass that will begin to grow and flower. This month is all about grasses. Grasses are found widely distributed world over, even in the cold regions of the Arctic, or mountain tops where they come alive as temperatures rise. Grasslands biomes are areas where the dominant vegetation is grass. These places are rich in biodiversity and have their own special characteristics. Sholas, steppes, savannahs, prairies are some examples of grasslands. Although the dominant vegetation is grass these habitats have other species of herbs and shrubs, trees being scarce. 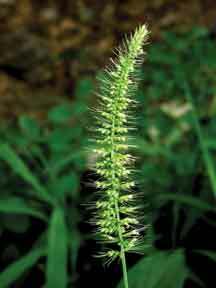 Sedges and rushes seen in grasslands or near water bodies are often mistaken to be grasses by a layman. They are not true grasses although in appearance they may look like tall grasses. Grasses are monocots and belong to the family Poaceae. Their stems are hollow, except at the nodes and most of them are found either just above the soil (stolon) or below the soil (rhizome). What is seen growing erect are leaf sheaths that enclose and protect young shoots from which new leaves would arise. These are called culms and are hollow, except at the nodes where they are solid. Not all grasses have culms; while many tropical species have them, several others have stems that either creep on the soil as stolons or grown underground as rhizomes. Leaves arise from nodes and consist of two parts, the leaf sheath and the leaf blade or lamina. At the junction of the sheath and the leaf blade is a flap of tissue called ligule. These may come in different forms or may be absent sometimes. In some leaves two projections may be seen on either side of the ligule and these are called auricles.